Franeys Carpet One is your one-stop-shop when it comes to carpet, as we offer one of the area’s best selections. We offer a variety of carpet styles, including Stanton Carpet. We love Stanton because of its premium performance and fashion forward design and colors. Stanton offers so many different style and design options, nothing is considered off limits. If you want to add simple elegance to your home, Stanton certainly has you covered with every color imaginable. 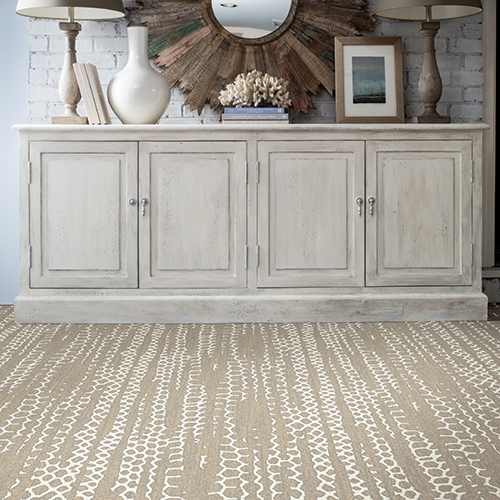 Or, you could choose a Stanton patterned carpet that becomes its own centerpiece in whatever room it is located. More importantly, no matter which type of carpet you choose, you have the peace of mind knowing it was made to last. We’re proud to be an authorized Stanton Carpet dealer. Two of our favorite collections, however, are Atelier Marquee and Karaman. Atelier Marquee: The Atelier Marquee collection is one of the newest additions to our carpet selection, and we are excited for you to come feel the difference. Atelier Marquee carpets are made from nylon, so they are durable and easy to clean and maintain. We recommend choosing Atelier Marquee carpets for bedroom settings because they are extremely comfortable. In fact, the carpets are so soft and warm that you can probably sleep on them! Karaman: Unlike Atelier Marquee carpets, Karaman carpets are made from real wool. This means they are environmentally friendly and naturally stain resistant. Our favorite Karaman style is Leyla because it’s available in many stylish patterns. Click here to learn more about Leyla. Be sure to visit our Visalia, CA showroom to check out our Stanton Carpet display!